Aaron was in Atlanta briefly for work and brought me back Chick-fil-a sandwiches on the plane. Much the same as I have carried In-n-Out burgers home for him. That is love. January 2007 I blogged about businesses I wished would come to Rochester. 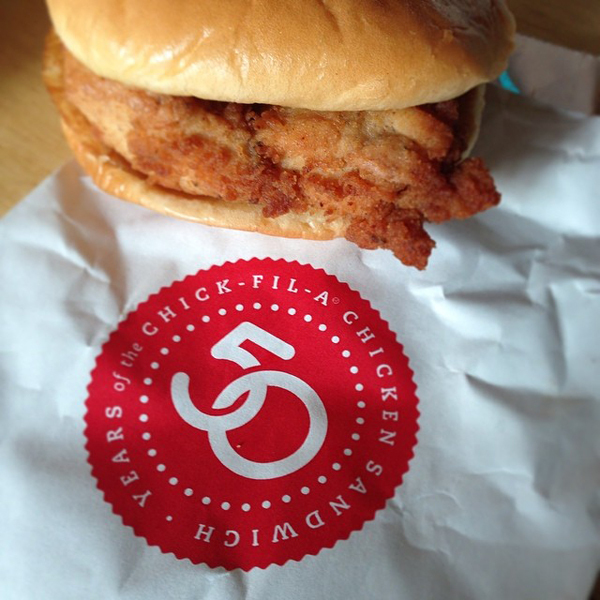 I was thinking about this because I wish we had a Chick-fil-a in Rochester. I think it's time to revisit the list! 9. Baja Fresh - no Baja Fresh but we did get several Chipotles which are great! I would also like to note that since 2007 I discovered Melting Pot, lusted over it, and then we got one! 1. Jamba Juice - never stop believing! 9. Krispy Kreme - can you believe we had several of these and then they all closed? 10. Long John Silvers - I am kinda embarassed about the fast food on my list but what can I say... every once in awhile I have a craving. I heard we were getting an Arthur Treachers which I think are similar. Let's see what we get in a few years!